Combine the best properties of silicone and urethane sealants in one package. By fusing silicone and urethane sealant chemistries, the strengths of each provide unique solutions and improved application. Hybrid sealants are inherently low in VOC and odor. This results in a user-friendly, high-performance product. Hybrid sealants offer several other important advantages – color stability, paintability, reduced shrinkage, moisture tolerance, minimal dirt pick-up, and exceptional adhesion to most construction materials. Plus, the addition of our new Dynatrol I-XL Field Tintable Hybrid allows for unlimited color options in the field. This field-tintable hybrid sealant utilizes our Universal Color Packs. Save time and materials by mixing the perfect color for your project on-site. Traditional sealant chemistries have remained unchanged for the last few decades. 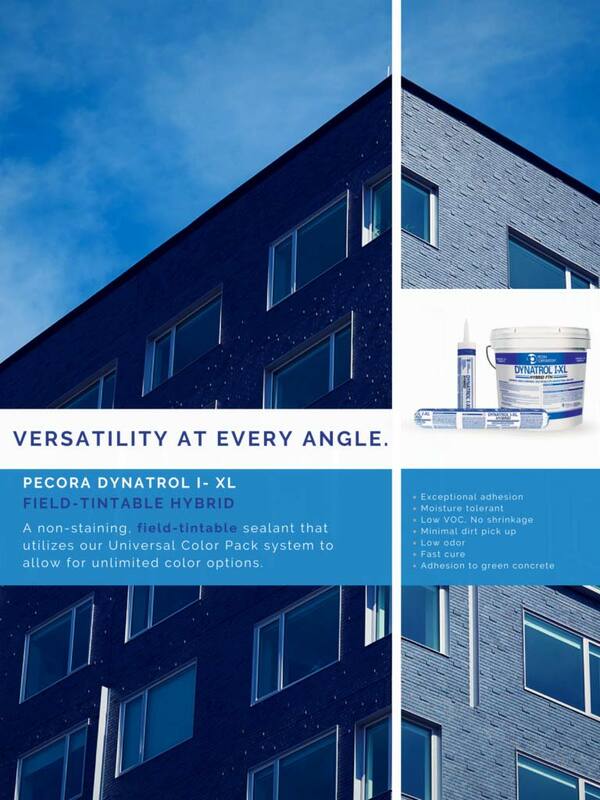 Take versatility a step further- choose performance, sustainability and adaptability with Pecora Hybrid Sealants.